The median price for a San Francisco metro area home increased by more than 20 percent for the 12th consecutive month, February’s S&P/Case-Shiller Home Price Indices show. Prices in San Francisco grew by 22.7 percent year over year in February, slightly less than in January but still one of only two areas on Case-Shiller’s 20-city composite to put up annual gains of more than 20 percent. As was the case in January, San Francisco was one of seven regions to show positive month-over-month growth (0.2 percent). Annual U.S. home prices across the composite increased 12.9 percent in February — a slowdown from previous months, according to the report – but Golden State real estate markets still rank among the country’s hottest. Price gains aside, Case-Shiller’s February report notes that lackluster home sales volume and fewer housing starts are potential sources of concern for the national housing recovery. 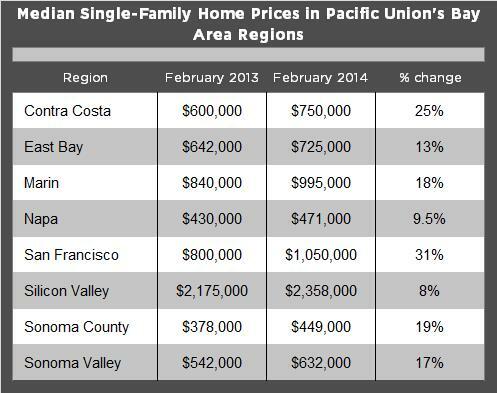 A closer examination of MLS data as of April 29 shows positive yearly price growth for single-family homes in each of Pacific Union’s nine regions. However, gains were for the most part less dramatic than in January, when they topped 40 percent in both San Francisco and the Sonoma Valley region. San Francisco County saw the largest year-over-year home price increases in the Bay Area in February – 31 percent – and the median price topped $1 million for the second month in a row. Our Contra Costa County region also posted price gains higher than Case-Shiller’s California average: 25 percent. Price upticks in the rest of our regions ranged from 19 percent in Sonoma County to 8 percent in Silicon Valley. Despite the moderate monthly growth, homes in Silicon Valley commanded the highest median prices of those in any of Pacific Union’s regions: $2.36 million. Previous PostPrevious Worried You Don’t Qualify for a Home Loan? You May Be Pleasantly Surprised.